Classic Custom Builders is comprised of a team of professionals with decades of home building experience. Each member is committed to working as a cohesive unit to meet each client’s needs, as well as providing the highest level of personalized customer service. With their personal touch, a team of professionals, top quality product, and seamless process, this is a partnership built to make the client feel like royalty. 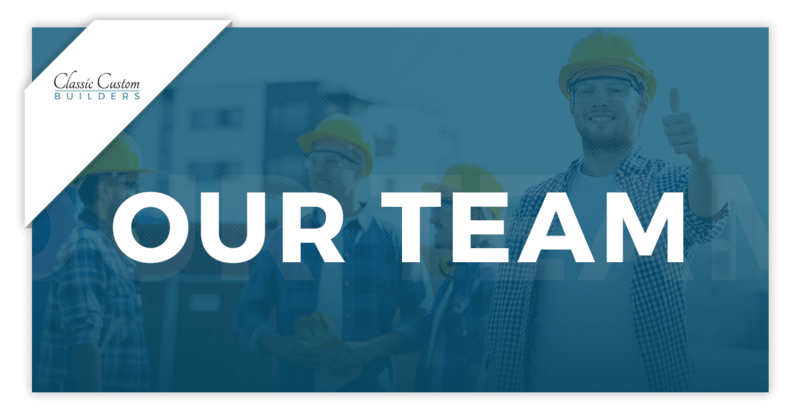 This team spirit means that homeowners have direct access to Ray, trade contractors, and interior designers, and are able to weigh in on decisions directly related to the building and design of their new homes. This team philosophy results in a pleasant process throughout and a smooth transition into the new custom home. Sandy V., having “heard horror stories about building a house,” never thought she would do it herself. But, when her dream house wasn’t on the market, she followed a friend’s suggestion to look at Classic Custom Builders’ Murano at Highland Meadows Golf Course subdivision. First drawn to the customizable platforms and exceptional quality of work, Sandy was eventually struck by the seamless and timely homebuilding process. “These guys have it streamlined,” she said, describing her buying and building experience. ” I was impressed with all of them. This team is a group of trustworthy, efficient, and honest people.” One month into her never-imagined custom home, she says she wouldn’t change a thing. RAY SPENCER, Classic Custom Builders’ founder and president, has been in the homebuilding and development business since 1981. He thrives on the opportunity to help clients see their very own custom dream home materialize. Ray helps clients select a building site, understand the options available in plans and modifications to assemble their initial decisions as well as assisting them in finding a lender who can meet their needs. SCOTT OCHWAT has been a construction manager for Classic Custom Builders since 1991. He owned and operated his own framing business for eight years and has experience installing carpet, tile, vinyl, and hardwood floors. Scott enjoys meeting and working with clients while coordinating and supervising the construction of their dream homes. KAREN JONES has been the interior designer for Classic Custom Builders since its inception. She has experience in residential and commercial design since 1979. Karen’s goal is to make the building process fun and exciting. She makes the customer aware of the options available and helps them make final selections with which they can be comfortable.